We've been in a series studying God's healing Grace. That His goodness and Grace produces not only freedom and brings new life but also heals our bodies and restores our soul. We have established God is a faithful God. That He is always good and never has anything detrimental for us. In our last study, we began dealing with Scriptures that suggest God makes people sick. Today I sense the leading to further address religious tradition concerning this area of healing. Tradition likes to remove God's goodness and replace it with their rules, regulations, and statutes. We aren't immune from this onslaught of performance based faith concepts challenging us and our freedom in Christ. Jesus dealt with it in His time and so do we. There is a passage in the Gospels that illustrate this point. 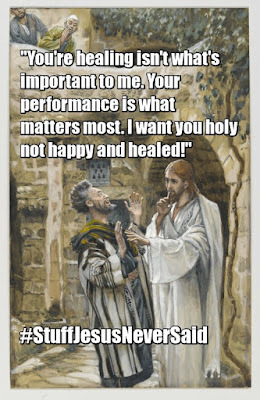 God wants you "Holy" not happy and healed? Religious tradition is most concerned with men keeping all the "rules". What is interesting to note is these "rules" seem to change or alter based on the particular denomination or ministry. One group suggests that women can't cut their hair or wear makeup. Another group isn't concerned about hairstyles or makeup, but they forbid women from teaching in a public church setting. They've bought into a concept that God isn't about a relationship but about maintaining the rules. Take note how Jesus handled tradition. Jesus went into the synagogue again and noticed a man with a deformed hand.2 Since it was the Sabbath, Jesus’ enemies watched him closely. If he healed the man’s hand, they planned to accuse him of working on the Sabbath. This is a powerful passage. This passage reveals the true heart of Father God. This passage is clearly illustrating Grace vs the Law and traditions of men. Jesus Earthly ministry had a manifold purpose. There are times when He illustrated the Law in all its true perfection. Thus revealing the impossible standard and proving our need for a Savior. Other times He revealed the Father's heart of love and gave a sneak peek of the New Covenant. This is why Jesus is perfect theology. In this passage we see Jesus enter the synagogue. What did He see or focus on? His eyes were drawn to the needs of another. His heart of compassion, the perfect love of the Father, saw something withered and broken and desired to see it made whole. Take note that others were in the synagogue. What was their focus? Religious tradition, the enemies of Jesus, weren't drawn to the broken and hurting. They were watching to ensure all their rules were being kept. This is why religion's eyes are closed to the plight of lost humanity. They are so focused on men keeping a standard that they miss revealing the love of God, that when received is the only thing that produces true change. Jesus wasn't moved by the "rules". In fact, He paraded the man out front. He was saying in essence, My goodness and Grace and love trump any of your religious traditions. Note, this wasn't done out of rebellious strife and hate towards His enemies. He was attempting to reach them as well. 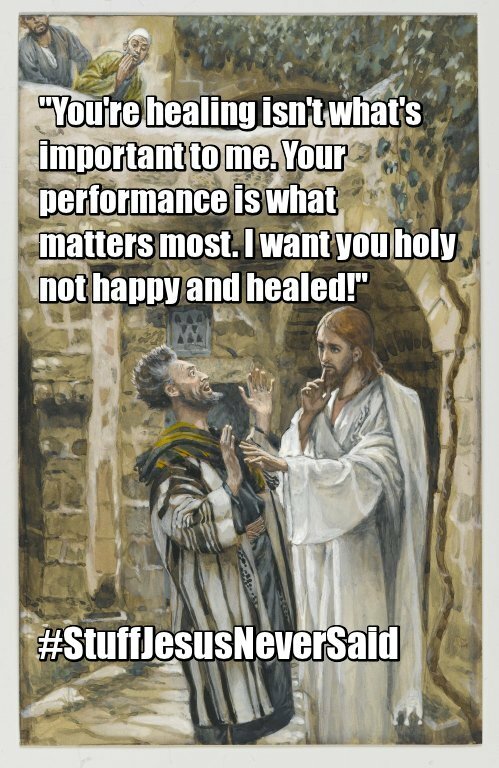 Jesus addresses His critics. He conceded to them yes the Word says this, however, He also revealed that they added to the Word with their traditions. He was saying your traditions aren't helping anyone. Your traditions are keeping men from walking in wholeness. What was their reaction? Yes, Jesus, you're correct. We've seen our error, we missed it. Was this how they responded? No, they remained silent. They chose their traditions over God's goodness and love and mercy. Jesus, our good God of love and mercy, was angry at this. So many see God as angry at the lost in this World. Certainly, God is angry at injustice. However, He is pouring out His love to reach lost humanity. These here already knew the truth. Yet they exalted tradition over truth. This is what angered the Lord. Their hardened heart both angered and saddened Jesus. Jesus brought life and wholeness and healing to this broken man. He healed the withered hand. What a sign and a wonder. God is good. You'd think there would be shouting and rejoicing at the goodness of God. What was tradition's response? They wanted to kill Jesus. Jesus wasn't moved by the fear of man and continued ministering His Healing Grace. Jesus and His all the time goodness and too good to be true but true, over the top Grace, anger religion but brings life and wholeness to the hurting and broken. His Word reveals the truth that topples the traditions of men. His loving kindness and mercy draw the masses whereas religion repels them. Truly, Jesus is greater than religion. God is a good Father who desires above all that you be made whole, spirit and soul and body. His loving kindness is extended toward humanity and He is inviting them to partake of His new life and experience a living, everlasting relationship with the creator of all the universe. Relinquish the traditions of men and embrace the truth of the Word.